Unfortunately, no one is perfect. We should all accept this human trait and look at the candidates’ experience, knowledge and ability to handle situations in a crisis. There is a significant difference between infidelity and sexual harassment. Infidelity is between two consenting individuals. Infidelity is morally wrong but is legal. Sexual harassment is not mutual. Sexual harassment is morally wrong and is not legal. The alleged accusations leveled at Cain are serious and should not be dismissed as frivolous. Cain has admitted that money was paid to the two women in question, and it is his responsibility to resolve these allegations. Greta Van Susteren said it best when she grilled Cain on the accusations. She asked Cain, “You know, women see sexual harassment sometimes very differently than men.” Sexual harassment is a very difficult thing to prove after an accusation is made. Greta commented to Cain, “You know, people don’t necessarily sexually harass necessarily in crowds.” Sexual harassment can happen in crowds but most times the abuser hides and directs his advances to certain women, usually the most vulnerable. It is even conceivable that the person that is being sexually harassed could lose her job, be demoted, not promoted or transferred if she does not comply or ‘play’ along. At times these women are labeled as not being good sports or not getting along. Being sexually harassed can range from an annoyance to full blown sexually aggressive behavior which may include intimidation. Most women learn from other women who to watch for. They also learn from watching what happens to other women when they ‘tell’. It is not unusual for one woman to report sexual harassment and find herself without a job. This in turn sends out a red alert for other women not to report their encounters. Things may have progressed since the 1990’s so that this does not happen in the work place, but I sincerely doubt it. Women still need to hold on to their jobs. It is disturbing that not one conservative voice is defending the fact that sexual harassment directed at women in the work place is a serious offense. It is also very sad that these two women, who may have already suffered at the hands of Cain, are being maligned by Cain’s supporters. Maybe the more sensible thing would be to wait and see if in fact the accusations are true. More curious is this furor between the mainstream media and Cain in that no details of the allegations have surfaced other than the amounts of the pay outs, $35,000 and $45,000. The relationship between the MSM and Cain on the sexual allegations is beginning to really be bizarre. At the media press conference after the CAIN – GINGRICH DEBATE at The Woodlands in Texas, Cain became hostile towards the reporters asking him about the alleged sexual accusations. 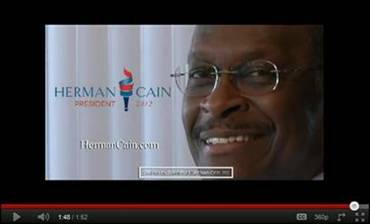 Again in Cain’s Let Cain be Cain attitude he shifted the blame towards the MSM. As conservatives we must be able to discern who we want in the White House after November 2012. If we ever hope to have a man in the White House that respects women, we must let Cain be Cain and let him solve his very own crisis. If there is nothing to the allegations, then he will be a stronger candidate, but if there is merit to the allegations, better we know now and not after he is our nominee or worse, after the inauguration.